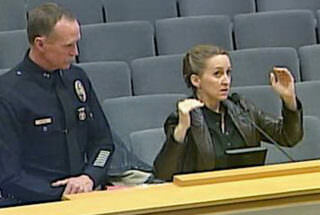 LAPD Deputy Chief Bob Green and Centinela Youth Services’ Executive Director Jessica Ellis. The only pre-arrest juvenile diversion program in California is seeking nearly $1 million to expand into the San Fernando Valley, so its leaders came Tuesday to the cash-strapped LA Unified to ask for about half of it. Although four of the seven school board members at the budget committee meeting spoke positively about the program, they agreed they need more data before investing in the program, particularly regarding how it could save the district money by increasing attendance. “We need to talk about how to better invest our money up front and invest in the future because it’s cheaper,” said board member Mónica Ratliff, chairperson of the Budget, Facilities and Audit Committee that heard the report. 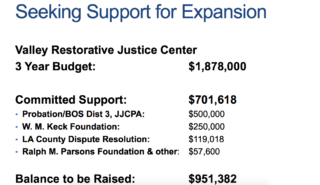 Centinela Youth Services, which has been offering restorative justice programs for 30 years to LA-area youth for free, needs $951,000 for its expansion into the Valley, said Jessica Ellis, the executive director of the program. Ellis said LA Unified has not funded the organization in the past but they are now asking the district to provide $300,000 to $500,000. Of its projected three-year budget of $1.88 million, Centinela Youth Services has received committed support for $700,000. About 43 percent of the youths served by the program are from LA Unified, and after the Valley expansion 60 percent will be from the district, Ellis estimated. She said many of the crime victims are LA Unified schools and students. 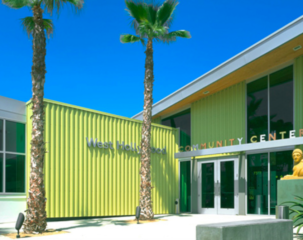 The three-year budget needs for Centinela Youth Services’ expansion into the Valley. The youth services program, which is being replicated in other parts of the country, takes children ages 9 to 18 with a minimal criminal history and works with them to keep them out of the justice system and get them back into their schools. It also works to avoid expulsions and persuade the schools to welcome back the students. But Centinela Youth Services counselors have had trouble getting students back into their schools. Ellis said there is no one from LA Unified headquarters to coordinate with and many principals don’t return phone calls. “We can get the principals to call you back,” said a surprised Ratliff. Chief Financial Officer Megan Reilly noted that if principals knew that the program could help their daily attendance, they would be more apt to return phone calls. Reilly reported last year that a 1 percent increase in attendance would gain $40 million a year in state funding and said LA Unified lagged about 1.2 percent behind the state average in attendance. The cost for incarcerating an average youth is $230,000 a year, and the average cost for the youth services program is $700 to $4,000 a year, Ellis said. Centinela Youth Services building in Inglewood. Ratliff said she wants a more specific breakdown on why there’s such a wide discrepancy in the costs per student. After getting more data, the budget committee could bring the request to the full board. Ratliff suggested that Ellis tap into some of the Los Angeles-based philanthropists, and Reilly suggested that they ask the state to kick in money because it’s financially better than incarcerating more people. Ellis said that she has worked on both ideas and continues to get state and private grants. Private funds have come from the Ahmanson, W.M. Keck, Ralph M. Parsons and Weingart foundations. LAPD Deputy Chief Bob Green worked with the Centinela program and said he is amazed at how well it keeps youth out of the justice system. He explained how the program could take a youth accused of stealing a car or a burglary and work with them for six months and help them realize the consequences of their actions. Fellow board members Ref Rodriguez, Scott Schmerelson and George McKenna said they like the program’s track record.